On Saturday, Emily Cavanagh held a book party for her debut novel, The Bloom Girls, at Island Images Gallery in Oak Bluffs. 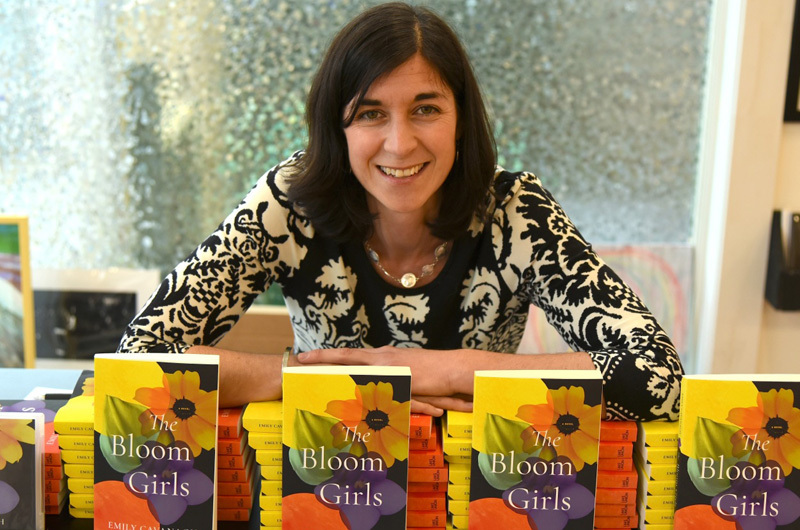 Emily Cavanagh’s debut novel, The Bloom Girls, is a soulful tale of sisters struggling to face unique personal challenges after their father’s untimely death. Told from the perspectives of three sisters, the story raises questions such as: Can secrets protect without doing harm? At what age are we held accountable for our actions? When is it legitimate to write off a family member? The book was published by Lake Union Publishing and on Saturday, Ms. Cavanagh, an English teacher at the Martha’s Vineyard Public Charter School, hosted a book party at Island Images Gallery in Oak Bluffs. In the opening scene of the novel, youngest sister Suzy Bloom is cracking egg after egg, struggling to perfect a soufflé while also trying not to vomit. She’s new to her job at Food Art Magazine and newly pregnant. Her fingers are crossed that her third try will be a success when a supervisor informs her that she has a phone call. Her father just died of a brain aneurysm. This sets in motion both the plot and heart of the story as the Bloom sisters reunite at the seaside cottage in Portland, Maine where their father lived. But each one of them is carrying some secrets from their own lives. While this may make Vineyarders feel at home, the sisters feel otherwise as they are confronted with confusion and guilt. When they were teenagers, their father had been accused of sexual misconduct while teaching at a private high school. Although not every sister knows the circumstances, their family was nevertheless changed irrevocably. Now, these details come to light again. Over bottomless cups of coffee shared on frosty days in Portland, the three sisters speak their minds and eventually realize the importance of going backwards before they can move forward. For those who enjoy a fast read that has substance, The Bloom Girls fits nicely. And fans can expect more in the way of strong female characters from Ms. Cavanagh. Next out in 2018 is her novel, This Bright Beauty, a tale of two sisters coping with distance, parenthood and mental illness.